Catalysts are more uniformly distributed to cross-linking initiation sites. Drier concentration may be increased substantially without risk of phase separation. SpeedyDry allows printers to reduce production time on jobs. Furthermore, printers reap this benefit without sacrificing the overall quality of the job. In addition to reduced ink drying times (by as much as 75% on most substrates), Speedy Dry allows for the use of very difficult inksubstrate combinations. Thus, printers become more competitive in the marketplace, as they can offer a wider range of print ossibilities. 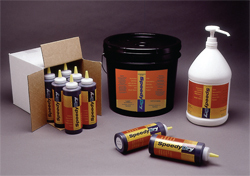 SpeedyDry dries inks faster than any other drier additive. Tolerant of changes in ink chemistry. 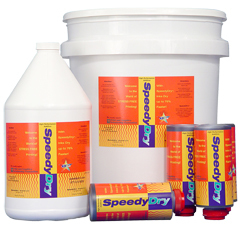 SpeedyDry has a broad concentration range. Add more SpeedyDry for faster results. Does not require activation procedures or special equipment. Works on every job when used as directed. A reduction in labor directed to slip-sheeting and removing slip sheets prior to post processing. Reduces work-in-press inventory with concurrent improvements in profitability. Control of dry time. Add more drier and shorten the dry time. Allows the workload to be shared by the less experienced pressmen. Eliminates the need for expensive ink, equipment or other additives. Fast turnaround times to customers for rush print jobs. Reduction in labor costs and bounced jobs increases opportunity for success.